There’s a hidden layer of detail beneath chemical structures that students new to organic chemistry often miss. I’m talking about partial charges. Although each of these bonds appears to be covalent, the electronegativity of each atom determines how “greedy” it is for electrons – and this means that many bonds that look “neutral” are actually polarized. Why is this important? Because attraction between opposite charges is the ultimate driving force in so many chemical reactions. 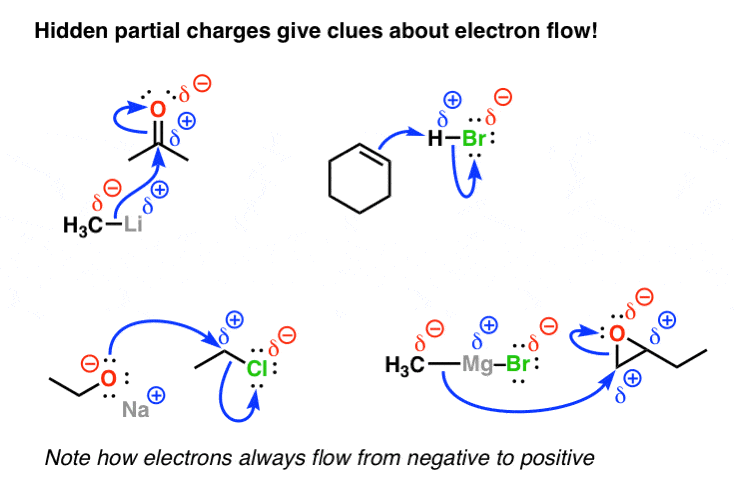 You can see how these “hidden” partial charges provide an important clue for how these reactions proceed. Note – the arrows show the movement of a pair of electrons (electrons truly are to organic chemistry what currency is to economics – it’s all about the study of their flow). Note how the arrows always flow from negative to positive – never the opposite way. It’s why a knowledge of electronegativity trends is absolutely crucial to doing well in organic chemistry. This makes me miss my organic chemistry days! So much easier to comprehend than medicine…. (and I am being serious with this comment, in case it sounds like sarcasm). Ha! So what do you find the toughest about medicine? A list of organic chemistry reactions and mechanisms. From basic nomenclature to detailed substitution, elimination and addition reactions.